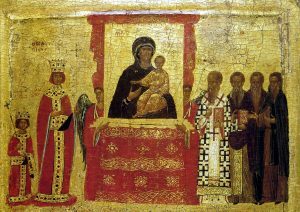 On this Sunday, we also remember the Nicea II Council in 787, which defined that we can make images (icons) of our Lord and the saints, and venerate them. This council was held in the midst of the iconoclastic (the “image breaking”) controversy, the first phase from 726-787, and the second phase from 814-842. It draws attention to how important images are for us. I know of few homes that do not have a picture, today usually a photograph but sometimes a portrait or drawing, of those we love. If we love Christ first with our whole heart and mind and soul, the image helps us to focus that love. We know these images are only paper or wood and ink or paint, but through the eyes of our body they make the person present in spirit. Yet some people hate images. There is a danger of idolatry, and the council did dialogue with those people who had that fear of idol-worship, and so defined clearly how images are to be venerated: “For the more they are contemplated, the more they move to fervent memory of their prototypes. Therefore, it is proper to accord to them a fervent and reverent adoration, not, however, the veritable worship which, according to our faith, belongs to the Divine Being alone — for the honor accorded to the image passes over to its prototype, and whoever adores the image adores in it the reality of what is there represented.” This is the Christian faith. We cannot make images of the divine nature, but the mystery of the incarnation, in which the Word of God became truly a human being, the two natures united in one person, allows us to make images of Jesus, who was like us in every way except sin. This leads us to a deeper mystery, that we are created in the image of God, and that “all of us, gazing with unveiled face on the glory of the Lord, are being transformed from glory to glory, as from the Lord who is the Spirit. (2 Corinthians 3:18)” And the glory and the wisdom of the Lord is his emptying, his love, his cross and his resurrection. More on the subject can be found here.